Let me explain for in an example. JCPenney agreed to send Ebates a thank-you referral of 12% Cash Back for whoever shops online at JCPenney via the Ebates website. When a customer shops and purchases something, Ebates then splits the referral commission with the online shopper and the referrer and each earn a 6% Cash Back. Win #1 – The Online Retailer: The online store is getting more of us to shop online at their stores. Win #2 – Ebates: Ebates receives a thank-you commission for referring us to shop online. Win #3 – The Shopper and the referrer: Ebates splits that commission with them in the form of CASH. I guess you already shop online as most of us do these days so why not earn as you shop, just like many are doing already. Creating an account with Ebates is FREE and simple. To create an account with Ebates, all you need is an email address or a Facebook account to get started. Once you create your account, you can shop online just like you would normally do, however now you can earn between 1% – 40% CASH BACK at over 2,000 online stores that are growing! The Cash Back is truly Cash Back, meaning you will either receive a check in the mail or your money will be deposited into your PayPal account. Remember, this is actual money, not a bunch of gift cards, points, or anything like that. Just for signing up you will receive a $10 bonus because I referred you to the Ebates site! Just to be 100% transparent, Ebates will also send me a thank-you referral for referring you to their site, but guess what, you can also refer your friends and family to their website and earn the same thank-you referral as well if you like! That’s just another feature about Ebates an I will explain that a little later. 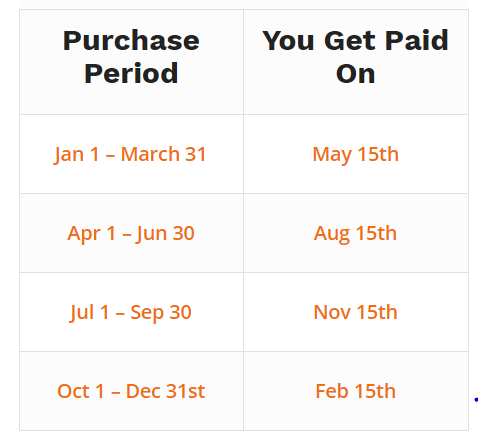 Firstly below are some details on saving as you shop with Ebates. 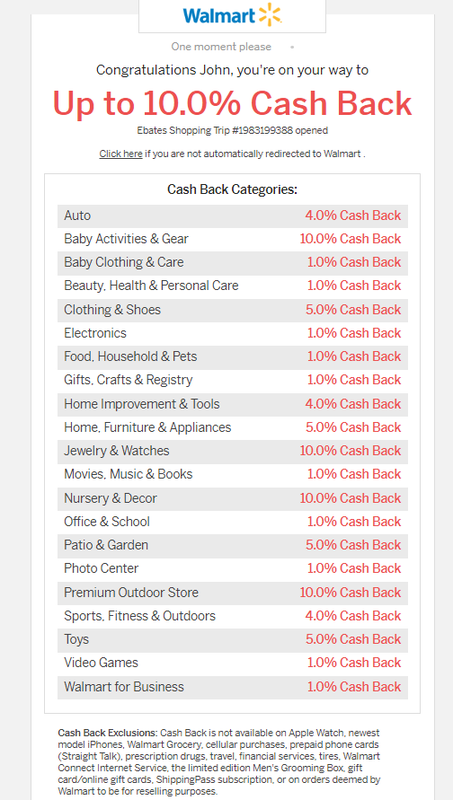 Right now, the vast majority of Cash Back savings is online, however there are specific stores that offer in-store Cash Back as well. Before you shop online, head on over to the Ebates website and you can search the 2,000+ online retailers to see if they have a partnership with Ebates. Once you find a store where you’re going to shop, simply click on the button of that store. You will then be automatically redirected to Walmart’s website to shop. This extra step took a whole 10 seconds which in return offers you Cash Back for doing something you were going to do anyhow – shop online. 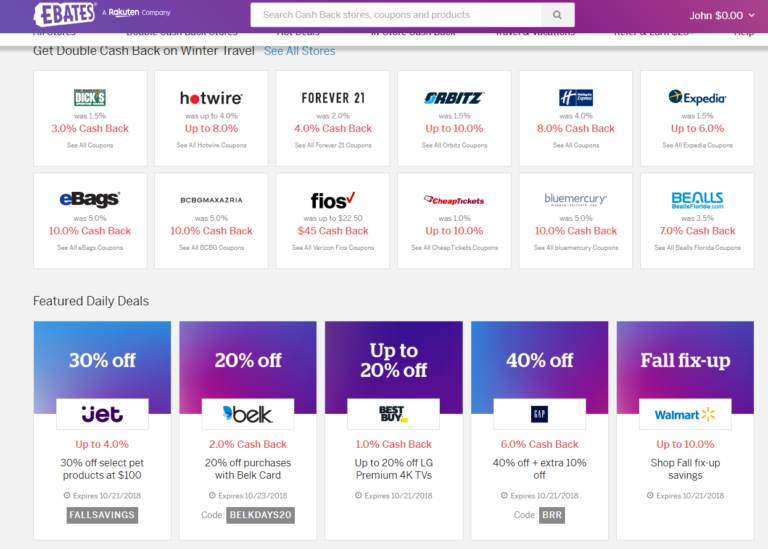 So not only can you get the benefits as an online shopper, Ebates lets you earn Cash Back from a selection of stores with their In Store deals. How’s that for cool! As of today, there are 66 stores that currently offer in-store Cash Back, but as the time goes many other store will jump on the Ebates band wagon to further increase their customer base. What you will need to do is add your debit or credit card to your Ebates Account. Then, before you shop in-store, check Ebates.com and see if that store has an in-store Cash Back option. All you will need to do next is click on “Link Offer”. Now, just make sure you use the same credit/debit card you added to your account when you checkout, and you will receive the same Cash Back as you would if you shopped online. 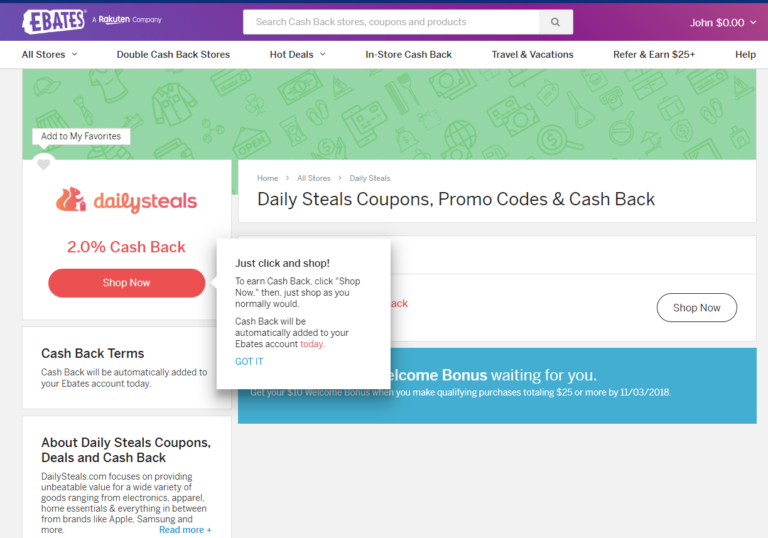 Using the Daily Steals not only saves the time of looking around the web for coupon codes before buying something online, using Ebates just makes it quicker and a lot simpler while also saving your money. 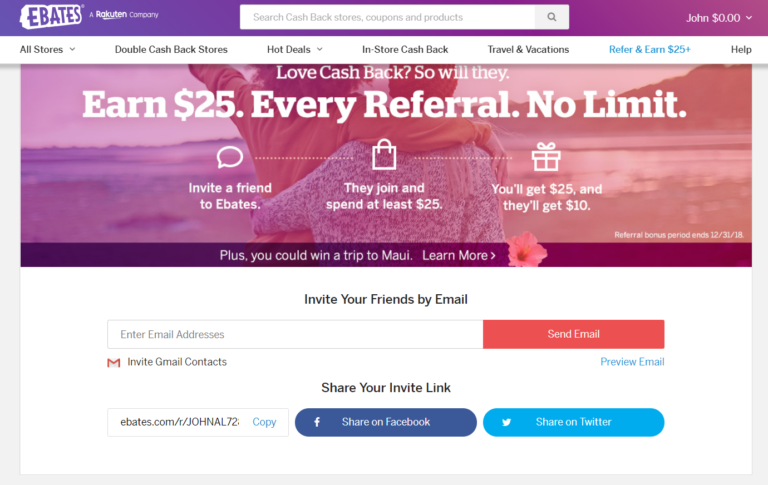 Using Ebates Referral Program To Make Extra Money As Well! Can I Really Make Money with Ebates? Well Yes You Can! Ebates extends their referral program to any Ebates member who would like to share the benefits on how to earn Cash Back and Savings while shopping online through Ebates. Once you create an account with Ebates, you can invite your friends and family to join in on the Cash Back savings, and YOU will also receive a thank-you referral. You can share Ebates with anyone via your Gmail contacts, by sending them an email, sharing on Facebook, or by copying your referral link and sending it out. If you have a website or blog, you can also add in the link and a small Ebates widget anywhere on your site. Help Your Friends Save and Earn A Little Yourself! How about that! Help your friends by showing them where they can save some money and earn some money just by shopping like you do and Ebates will pay you a referral bonus and at the same time your friends will get a bonus as well. Remember how earlier I showed you how this was a win-win-win. Well, I would also go as far as to call it a win-win-win-WIN! Win #4 – Share and Earn: You can earn money by helping your friends and family save money while doing something they’re most likely already doing – shopping online. Ebates is 100% free for anyone to use. Cash Back will show up in 48 hours or less. However, in very rare instances the retailer will not credit Ebates your cash back until their 30 day return period has expired. Ebates has an App for iPhone, Android, and iPad. Ebates does work outside of the USA. Just make sure the online retailer ships outside the U.S and Canada. Also, your Cash Back will come to you in whatever currency you set up as your initial payment method. We all know someone who is currently shopping online, so why not help them get some Cash Back? If you think this post was valuable and might be helpful to a friend, then please be a good sport and share it on your favourite social media and help spread the word about saving money, making money, and making your money have value again!